IRDG Leading Innovation - Save the Date! 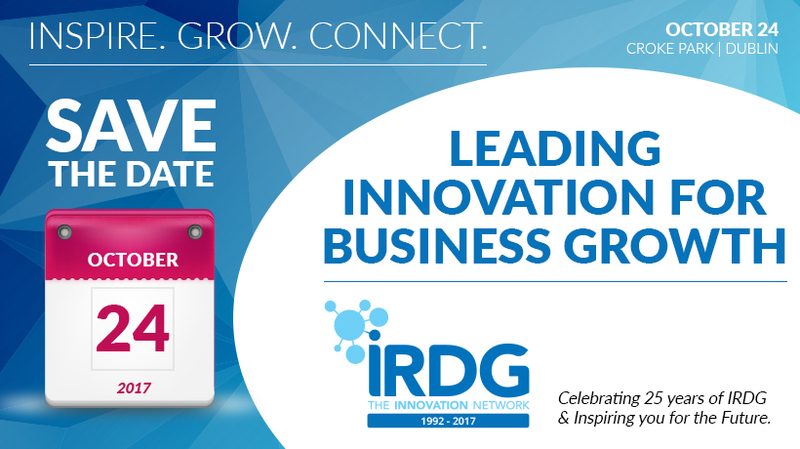 IRDG Leading Innovation – Save the Date! 25 years ago a group of business leaders had a vision. A vision that would see Ireland supporting and promoting Research, Development and Innovation. A vision that would grow jobs in Ireland and ensure Ireland would be a leading force in changing international markets. To deliver on that vision, IRDG was born. Today with the strength of over 250 other organisations, IRDG continues to deliver on that vision. On the 24th October, we will celebrate our past, but most importantly, look to the future, with our special Anniversary Conference. Leading Innovation for Business Growth at Croke Park is a day not to be missed. Bringing together Innovation Leaders and Executives from all sectors and sizes of industry, we will once again have an Annual Conference to inspire, connect and grow delegates. We will be announcing the full details next week. But for now, please SAVE THE DATE for Ireland’s leading business & innovation event of the year!